An excellent,large and regularly changing "eat as much as you like" buffet for just £6.50 (lunch) and £9.50 (dinner) in a colourful setting decorated with many Chinese lanterns. In addition you can, if you prefer, choose from an extensive menu of Cantonese, Beijing and Szechuan dishes. With easy parking nearby, it is ideal both for group celebrations and more intimate dining. 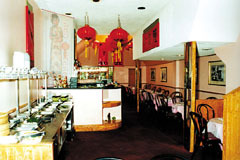 The quality, attention to detail and the friendly service have ensured the success and popularity of The Red Lantern. The Red Lantern welcomes parties for business lunches, birthdays or any special celebration. You can enjoy your meal in the beautiful, fully air conditioned surroundings with a small garden at the rear. The restaurant has a terrific atmosphere and is fully licensed with a good selection fo fine wines, beers and spirits as well as non-alcoholic drinks. the restaurant is wheelchair friendly. There is also a take away service with free delivery for orders over �10 within a 3 mile radius. The Red Lantern is fully licensed, there are ample parking facilities nearby and it is situated just two minutes walk from Harrow on the Hill tube station. Open Mon-Fri 12-3pm and 6-11pm, Sat noon-11.30pm, Sun noon-10.30pm. all major credit cards accepted. 10% optional service charge. Help yourself from the "eat as much as you like" buffet to more than 20 regularly changing dishes. A complimentary dessert is included in the price and there are always four soups on offer.